November 22, 2011 - On Monday around 7:15 PM a twin engine 1968 Beechcraft 60 aircraft, N523AA, made a hard landing, the nose gear collapsed and the aircraft skidded off the runway into the grass at Houston Executive Airport. Airport employees ran over to the accident site to see if anyone was injured but the occupants and the pilot had fled into the woods. When Waller County Sheriff's Department deputies and airport authorities arrived at the accident site they found large bags marijuana inside and outside the aircraft. 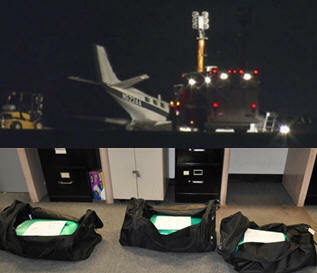 Authorities are estimating the aircraft was caring over 125 pounds marijuana. Houston Executive Airport is a private public use airport located in Brookshire about 30 miles from downtown Houston. The airport does not have a control tower (non-controlled airport) and pilots are requested to contact the Unicom frequency for takeoffs and landings. The pilot made an unannounced landing by failing to contact the Unicom frequency to make his landing known. The authorities used night vision goggles but had no luck in locating the pilot. Witnesses reported they saw shadows of a person or people running from the aircraft. Officials are puzzled how the pilot could have gotten away since the airport is surrounded by a 10 foot chain link fence with three layers of barbed wire. Authorities reported the aircraft was not reported stolen, the owner of the aircraft had passed away, the aircraft was auctioned off six months ago and the new owner failed to re-register the aircraft. Authorities have in their possession a cell phone and iPad that were left behind and have dusted the aircraft for fingerprints. John Kremmer, Chief Deputy of Waller County Sheriff's Department stated, "We were assisted by HPD, DPS and even HPD Fox Unit assisted us using their night vision in an attempt to locate the individuals, but no sign of them." Kremmer further stated "They had a few minutes head start and with cell phones these days, they could have called someone to come pick them up." The FBI, NTSB, FAA and Waller County Sheriff's Department will be investigating this incident. Houston Executive Airport executive director, Andrew Perry said there were no signs that the fence had been tampered with. ?This is the first time anything like this has happened. It would take some effort to get over the fence.? Perry further stated that the airport was reopened within two hours and there was no serious damage to the runway or any other facilities.